Google extends its service by making use of the original contents hosted by various users in the king of streaming video, YouTube, which is directly from the source and without the meddling of any TV network or production houses. overhaul” to YouTube, which already has a lucrative advertising system in place. 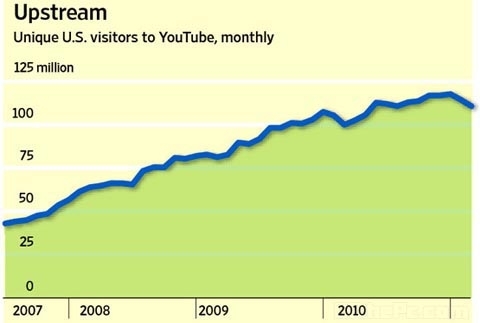 After Google bought the site for $1.6 billion in 2006 and eventually faced pressure to turn it into a profit center, YouTube went on the hunt for feature content, like TV and movies, expecting such content would make it easier to sell ads. It's said that the site is planning a series of changes to its home page to highlight sets of "channels" around topics such as arts and sports. About 20 or so of those channels will feature several hours of professionally produced original programming a week. "YouTube saw incredible growth in 2010 and we're excited about the future,"
YouTube's move comes as streaming video services are growing stronger, upending the way people watch TV shows. YouTube is looking to compete with broadcast and cable television, a goal that requires it to entice users to stay on the website longer, and to convince advertisers that it will reach desirable consumers.